A year after Katrina struck and New Orleans flooded, residents gathered near a rebuilt levee to remember those who died. Celia Nunnery, right, comforts her sister Carolyn, who lost her husband, Eddie James Ray, in Katrina’s aftermath. A year after Hurricane Katrina struck New Orleans and the city flooded, hundreds of residents of the Lower Ninth Ward gathered near a rebuilt levee to mourn and remember those who died. Celia Nunnery, right, comforts her sister Carolyn, who lost her husband, Eddie James Ray, in the aftermath of Katrina. Ten years after Hurricane Katrina struck the Gulf Coast and the New Orleans levees failed, we still don’t know how many people died in the storm and its aftermath. The uncertainty about the death toll is evident in the variety of numbers being reported by the media. A local news station in Georgia: 1,200. AccuWeather: 1,800. Insurance Journal: more than 1,800. The New Orleans Times-Picayune: 1,833. A local news station in western Michigan: 1,836. There is still no memorial listing the names of Katrina victims, still no way to know how many remain uncounted or unidentified, and still no agreement on how to count victims if a storm of Katrina’s impact hits the U.S. again. Ten years on, we’re still in the dark. Katrina killed 14 people in Florida before sweeping through the Gulf of Mexico and slamming into southeastern Louisiana on Aug. 29, 2005. The storm was eventually blamed for deaths in seven states, including as far north as Ohio. New Orleans took the biggest hit; wind, rain and the rising Gulf waters breached structurally flawed levees in Lake Pontchartrain, submerging 80 percent of the city by Aug. 31. The reason we don’t know how many people died as a result of Katrina is almost entirely because we don’t know how many people died in Louisiana. In the days after floodwaters poured into parts of New Orleans, it seemed as though the loss of life could number in the tens of thousands. Ray Nagin, the mayor at the time, said the death toll in the city could be as high as 10,000. A FEMA simulation of what would happen if a similar hurricane struck the area had put the number at more than 60,000. FEMA ordered 25,000 body bags for the New Orleans area. Although the losses never reached those levels, death in New Orleans was inescapable in the weeks after the levees failed — for its residents, for responders and for a horrified nation. News outlets headlined the latest counts of the dead and occasionally showed grisly images of bodies floating in flooded neighborhoods. 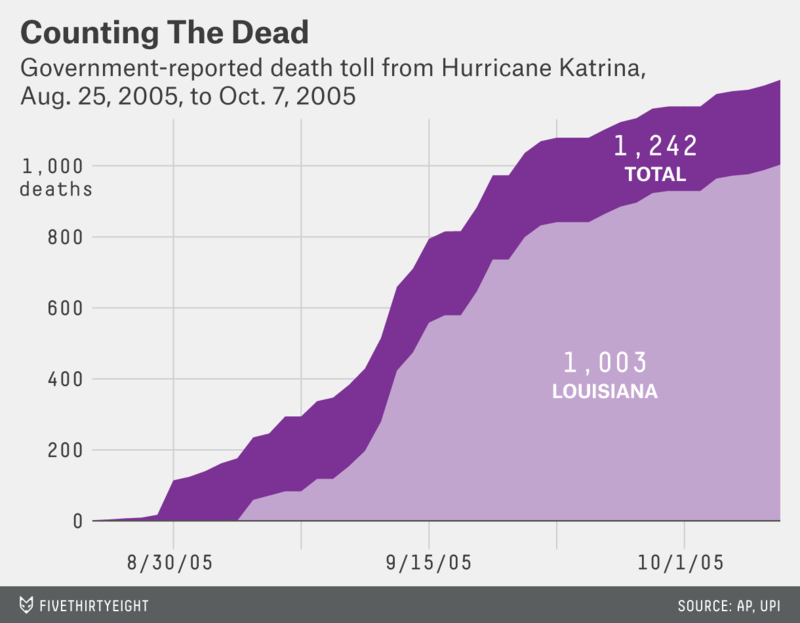 Like many post-Katrina efforts, the project to count the dead was hampered by natural and institutional obstacles. Robert A. Jensen arrived about a week after the storm. He is the CEO of Kenyon International Emergency Services, which helps track deaths after disasters worldwide. He’d previously sent around 10 workers to Louisiana to help recover bodies, but they’d been sitting idle in their temporary residence at a Baton Rouge funeral home for a week. “That week was critical, and it was wasted on bureaucracy,” Jensen said in a telephone interview. The official effort to recover bodies had stalled as local and federal agencies decided who would do so — and how. Eventually, procedures were set, with the Louisiana Department of Health and Hospitals taking the lead and Jensen’s company receiving a contract to coordinate the work in the heaviest-hit parishes. Collecting, identifying and counting the dead was an emotionally wrenching, often gruesome, sometimes thankless job. Kenyon workers had to walk through hospitals where the power had been knocked out. Extreme heat decomposed bodies. The sheer size of the affected areas meant each body might have to go through several checkpoints on its way to the morgue. And each stop could mean the loss of valuable information. Nearly every day, Bob Johannessen, a spokesman for the state health department, updated the death toll for Louisiana based on the latest data and shared it with the press, taking care never to extrapolate. That meant many people weren’t counted until long after they’d died. Arriving at accurate numbers was difficult. Lt. Don Kelly of the Baton Rouge Police Department had joined a local Disaster Mortuary Operational Response Team a month before Katrina. After the storm, he worked as a public information officer at DMort’s temporary morgue in St. Gabriel, 60 miles from New Orleans. That’s where most of the bodies of the victims were taken to be identified. “There was a lot of duplication, a lot of poor reporting from the field,” Kelly said in a telephone interview. It was only after two and a half months had passed that St. Gabriel reached a sad milestone: It had released more bodies to victims’ families than the number of bodies it still needed to identify. 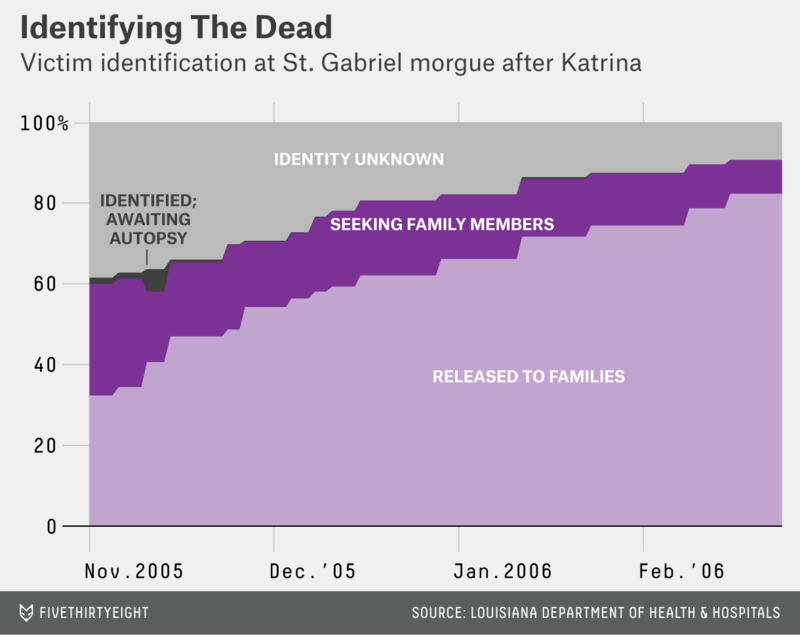 By its own admission, Louisiana never finished counting the dead. Its last news release on the topic, from February 2006, put the statewide toll at 1,103. Three months later, it added hundreds of state residents who’d died in other states. Three months after that, in August 2006, Louisiana counted 1,464 victims, with 135 people still missing. Today, when asked about the Louisiana death total, the health department cites a 2008 study that reviewed death certificates and concluded that there were 986 victims. But that study said the total could be nearly 50 percent higher if deaths possibly linked to the storm were included. One year after Katrina, the state’s medical examiner pledged to keep working until every victim was identified. Four years after that, he told the Houston Chronicle that he didn’t get the time or resources to finish the job. John Mutter, a geophysicist at Columbia University, was more familiar with earthquakes than hurricanes before Katrina. After the levees failed and the official death counts kept rising, Mutter began looking into it. There had not been a storm with a comparable death toll since 1928, when a hurricane pushed the waters of Florida’s Lake Okeechobee up and over the levees at its southern end, drowning thousands. Mutter was interested in what standards existed for counting how many people were killed by a hurricane. He discovered that there aren’t any. “They made their own,” he said in a telephone interview. Standards are extremely important for the grim task of counting the dead. They settle questions with no obvious right answer — for example, whether to include deaths that occurred immediately before a storm hit (such as someone who died in a fall while cutting down tree branches to mitigate anticipated damage). What are known as indirect deaths are the most confounding to the count. Direct deaths are those that occur from drowning or an injury sustained during the storm or post-storm flooding, while indirect deaths occur from some other cause that might be linked to the storm, such as an inability to access medical care to treat an illness. After Katrina, government counters in Louisiana chose to include indirect deaths based on an arbitrary time cutoff — people who were evacuated from New Orleans and died after Oct. 1 were not included, while those who died before were. The authors of the 2008 study that counted 986 Louisiana deaths took a different approach, counting only deaths that could be directly attributed to the storm. “I do think we’re likely an underestimate,” said Joan Brunkard, an epidemiologist with the Centers for Disease Control and Prevention and the study’s lead author. NOAA, meanwhile, has reviewed death reports and removed indirect deaths from its count, a major reason that its total went down. Mutter decided to try to improve on the existing counts for Katrina, seeking to include indirect deaths that had never before been linked to the storm. With the help of a grant of around $20,000 from Columbia’s Earth Institute, where he works, Mutter started a website to solicit information about victims. Some of the responses were helpful. But Mutter worried that his site wasn’t reaching the people who were hardest to find: Poorer people who weren’t Internet-savvy and might be suspicious of people asking questions. Mutter is sure the true death toll is higher than the official figures. But he’s not sure of the best way to figure out what it is. He once believed that it was more than 3,500; he now says it likely isn’t above 2,500. That still isn’t the highest estimate. Another effort arrived at a total of more than 4,000 with a method that researchers use to estimate civilian deaths in conflict zones. Mutter ran out of funding in 2010, and his work largely stopped then. But people still send him new names for his count, especially around the time of year that Katrina struck. NOAA’s work on the death toll hasn’t ended. Using newly available information from Louisiana’s epidemiology office and a database of historical mass casualty events in the U.S., NOAA researchers have completed a count of indirect deaths for Katrina and other storms from the last half-century. The database — which includes all events since colonial times in which 10 or more people died — was compiled by Wayne Blanchard, a retired manager of emergency management instruction at FEMA. The findings — estimates of the total number of deaths for Katrina and the other storms, broken down by direct and indirect causes — are expected to be published in a forthcoming issue of the Bulletin of the American Meteorological Society. Other federal agencies treat the keeping of official death counts as a core job, done by specialists, rather than the side project of people who are trained for other work. It’s a government mission to identify and count Americans who go missing in war or in terrorist attacks. The U.S. military has a unit — the Defense POW/MIA Accounting Agency — whose duty is to do that and only that for missing and captured soldiers. Katrina flooded New Orleans less than four years after the Sept. 11, 2001, terrorist attacks. The death toll of victims from that day — 2,977 — is well-documented. The names of the victims are inscribed in bronze at a New York City memorial. And as we’ve seen with the Vietnam memorial in Washington, D.C, the draw and effect of thousands of names can be powerful. Mutter thinks deaths stemming from disasters deserve the same respect as those caused by terrorism or war. “These are innocent victims,” he said. Mutter also wants a national accounting standard for recording deaths to be developed for future disasters. Stacy Parker Le Melle, an oral historian who interviewed at least 150 people in Katrina’s aftermath and collaborated with Mutter, said in an email interview that “without infusions of dedicated money and resources, getting an accurate accounting of the dead may never reach the top of the triage list” for governments responding to a disaster. While this impulse is understandable, Le Melle said, the result is devastating to survivors, for whom it is crucial to have the losses counted. Otherwise, “you and your memory will be erased from the official story,” she said.